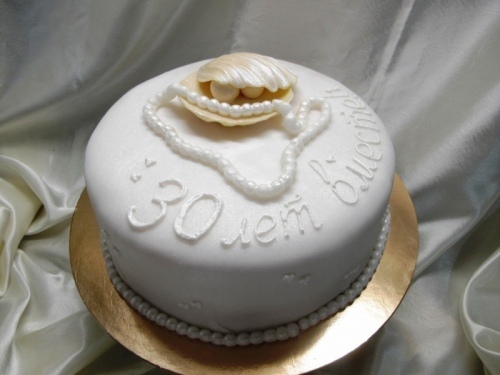 The thirtieth anniversary of the wedding is called a pearl for a reason. Relationships are like pearls, growing over the years and acquiring nobility layer by layer. Not every couple overcomes this line. Pearl wedding for spouses — not just a significant date, but also a reason for pride. After all, relationships like precious pearls must be maintained, and harmony and love be kept in the family. It is believed that the life of a pearl is fifty years, so there are still many beautiful and cloudless happy days of living together ahead. On this momentous day, the spouse traditionally gives his wife a poem of his own composition and a chic bouquet of white flowers. A gift can be a pearl necklace consisting of thirty pearls, each of which symbolizes the years lived together. The spouse gives her husband a piece of pearls, for example, cufflinks, and can also in a poetic form voice all love and tenderness turned to her beloved. On the anniversary day of our wedding, our ancestors rose at sunrise and went to the pond. There they threw a small pebble into the water and said: “As many pearls at the bottom of the river rest, so many of us are destined to live together without sorrows”. Invited guests do not have to choose gifts with pearls. On this day, as a gift, you can present any souvenirs, such as statues, home decorations, bed linen and other useful household trifles. Mark the solemnity of the day can be a valuable gift in the form of a family tree, which the couple will hang in a prominent place. A gift can serve as a photo album, which captures the most significant events in the life of the couple. This annual wedding anniversary, and the birth of children and grandchildren. Invited guests can order in the printing agency a beautiful book in which everyone will write warm words for the spouses. Religious ritual also contributes to the strengthening of relations, therefore on the anniversary day spouses attend church. There they put three candles in front of the icons of the Virgin for good health and longevity, before the Holy Crucifixion in gratitude for participating in family life and protection, the Most Holy Trinity — for long and happy years together. Another rite was the exchange of pearls. They put the pearls for the night under the pillows, and in the morning they looked at whether their color had changed. If there are no changes, then the spouses will have a happy and long family life. If the pearl is darkened, then the pair should pay attention to the health of their halves. Pearls that have changed color, says that spouses need to pay more attention to each other.